A pair of maintenance mechanics from the Michigan Department of Transportation’s (MDOT) southwest region have invented a calibrated salt-door stop – a stainless-steel bar that can be used on plow trucks to regulate salt flow from state trucks onto Interstates and state highways. Jordan Claus and Ryan Piasecki work at MDOT’s Paw Paw repair facility, which is part of a region that also includes Berrien, Branch, Calhoun, Cass, Kalamazoo, St. Joseph and Van Buren counties. The stops carry a price tag of $22 each. When installed to a salt hopper’s movable gate, the bars can be used to set calibrated salt-release levels. 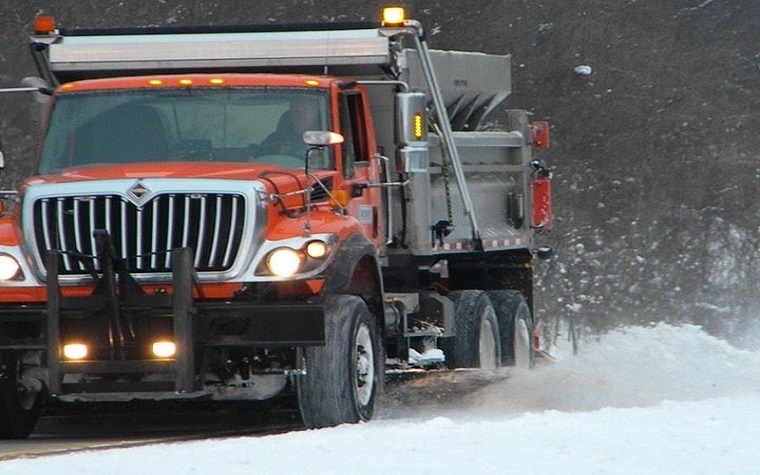 “Traditionally, our plow operators have relied on their lines of sight to set salt doors, resulting in varying door heights and salt use from one operator to the next,” Janine Cooper, operations engineer for MDOT’s southwest region, said. “These salt-door stops will eliminate the varying heights of salt doors and allow each operator to simply lower the door to a predetermined and calibrated height, resulting in reducing salt use and saving money." MDOT officials said using the salt-door stops could save the state thousands of dollars. They are currently installed on all 80 plow trucks in MDOT’s southeast-region fleet, and they could be in use statewide by next winter. A video showing how the salt-door stops work is available online at https://youtu.be/KteRe2uwC-s.